Few foods are as comforting as a heaping plate of fried chicken. Many families have their own recipe with a special mix of spices and herbs, cooked up to crispy perfection. But when you can’t get home to Mom’s for her fried chicken, where can you go to satisfy the urge in Oregon? At the following 10 best places for fried chicken in Oregon, you’ll find dishes that rival any family recipe. Here are our favorites! Screen Door Restaurant in Portland, Oregon offers “traditional southern cooking with north-western food values,” as described on their website. Fried chicken lovers will find lots to enjoy, including their crispy fried chicken strips, fried chicken and biscuit sandwich, and the Screen Door’s famous buttermilk battered fried chicken served with sweet potato waffle. Bellhop, Brothers in Cheer, sources most of their food from local farms. Their claim-to-fame? The fried chicken buckets to go, every Monday through Thursday from 11 a.m. to 9 p.m. Entrees include traditional fried chicken and flourless fried chicken, too. Larks Home Kitchen has two locations in Oregon, including one in Medford and another in Ashville. Both adhere to their philosophy of “daily pursuit of excellence.” Their “supper” dinner includes a to-die-for southern fried chicken breast, made with bacon pan gravy, herb buttermilk mashed red potatoes, and braised collard greens. Stop by one of the two locally-owned-and-operated Chicken Bonz joints, one in Springfield and the other in Bend, Oregon. They claim to be “the place that introduced Eugene, Springfield and Bend to chicken wings,” since 2002 according to their website. 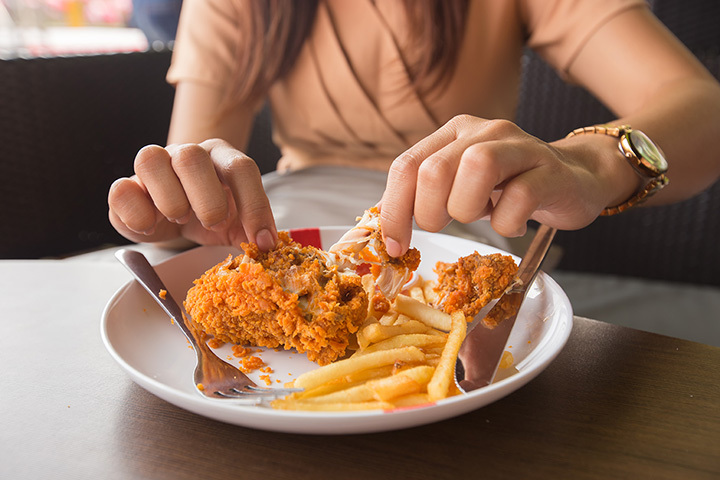 Get your wings to go or large appetite chicken lovers can get the all-you-can-eat buffet. Wild Oregon Foods has only been in Bend, Oregon since September 2017, but they’ve already made a name for themselves by serving farm-fresh food inspired by the ranchers they get their ingredients from. They’ve won the Restaurant Rookie of the Year from the Source Weekly, among other accolades. Come in on Friday for their incredible “Fried Chicken Friday” special. Loft Brasserie and Bar in Ashland, Oregon is a Parisian-inspired café with a Pacific Northwest twist. Their “fried” chicken option has a bit of French flair, but if you come in with an open mind, you’ll leave with a full belly. The French cut chicken breast will stay on your mind long after you take the last bite. Krewe du Soul in Salem, Oregon offers New Orleans-style food remixed for a Northwestern audience. The restaurant, squirrelled away in the Mission Mill Museum, serves Cajun, Creole, and Soul food. There’s nothing more soulful than southern fried chicken, and theirs doesn’t disappoint. Hot Mama’s Wings in Eugene, Oregon is the 2017 Readers’ Choice first place winner from the Register-Guard. They offer wings, burgers, sandwiches, full bar, and salads with weekly specials. Come in for their delicious fried chicken wings any day of the week until 10 p.m. Serving delectable fried chicken and other comfort foods since 1968, Heidi’s in Gresham, Oregon continues to delight. Their fried chicken comes in several varieties. Choose from the chicken fried steak breakfast option, the chicken wings, or even the chicken parmigiana. Copper River Restaurant and Bar offers seasonal menus in addition to their main and gluten free menus. One of their main menu specialties is their buttermilk battered crispy fried chicken, served with mashed potatoes and coleslaw. Consider the orange or kung pao chicken for a bit of an Asian twist.